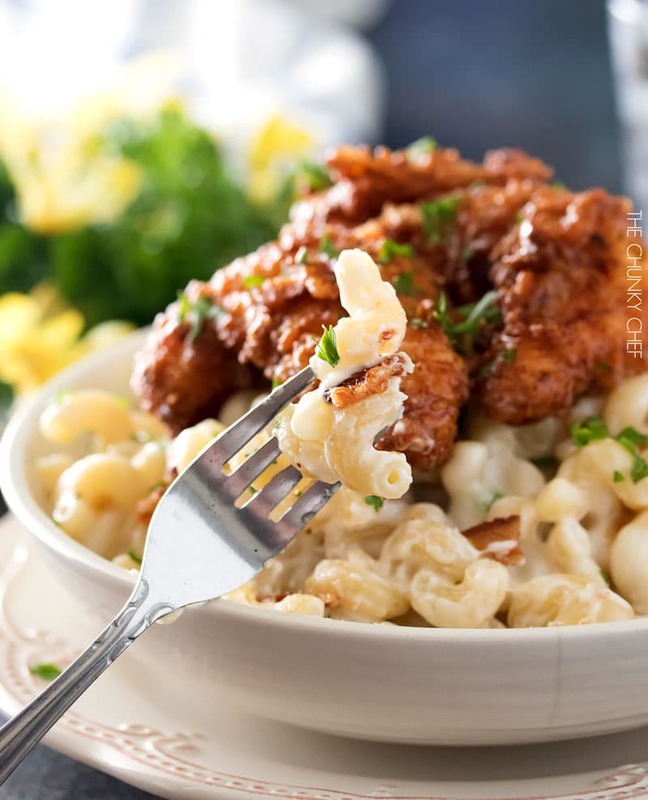 Have you ever had the 4 cheese mac and cheese with honey pepper chicken from Applebee’s? If you have, you know how INSANELY delicious it is! Every single time we go to Applebee’s, I order it… with no shame lol. 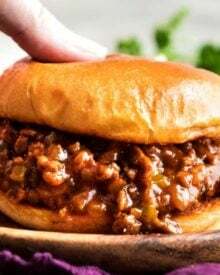 And ever since that first bite, I’ve been meaning to come up with a great copycat version… because let’s face it, I can’t eat out all the time, but I still crave that dish like no other! This is one of those times, where I honestly think the copycat version is better than the original! However, it’s been a little while since I’ve had the 4 cheese mac and cheese from Applebee’s, so I can’t be absolutely certain on that one. Boil your pasta ahead of time – just toss it with a little olive oil to keep it from sticking together and keep it in a resealable plastic bag in the refrigerator. Make your cheese sauce ahead of time – keep it in an airtight container in the refrigerator until ready to reheat. Mix up your seasoned flour ahead to time – keep it in an airtight container on the counter. Use pre-made frozen chicken tenders instead of homemade – it won’t be quite as flavorful, but will save you a few steps. In the restaurant, this dish is served with a breadstick on the side, so feel free to do that if you’d like… but since I’m watching my carbs, I figured the pasta and breading on the chicken was more than enough lol. If you’ve followed some of the other copycat versions of this recipe, there’s one way that mine deviates… I use an Anaheim pepper in my cheese sauce. The reason for that, is that whenever I’ve had this dish at Applebee’s, it always has diced pepper in it. Although I wonder if that’s a regional thing, or maybe just certain cooks put it in, because I’ve never seen anyone else mention the pepper lol. So feel free to omit that completely if it’s not what you’re used to. 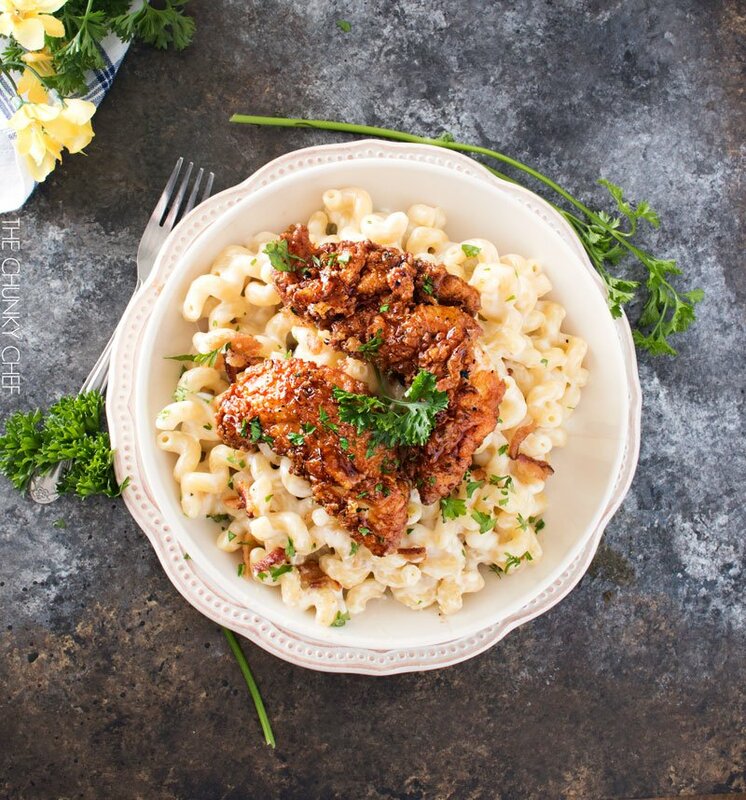 I really hope you give this copycat 4 cheese mac and cheese with honey pepper chicken a try! It’s long and involved… certainly not a weeknight meal… but SO worth it! The creamy sauce contrasted with the crunchy chicken works so beautifully with the savory cheese sauce and sweet glazed chicken! Lodge Enameled Dutch Oven – hands down, my favorite pot to fry in! House Autry Seasoned Flour – If you don’t want to make your own, this is a great alternative! 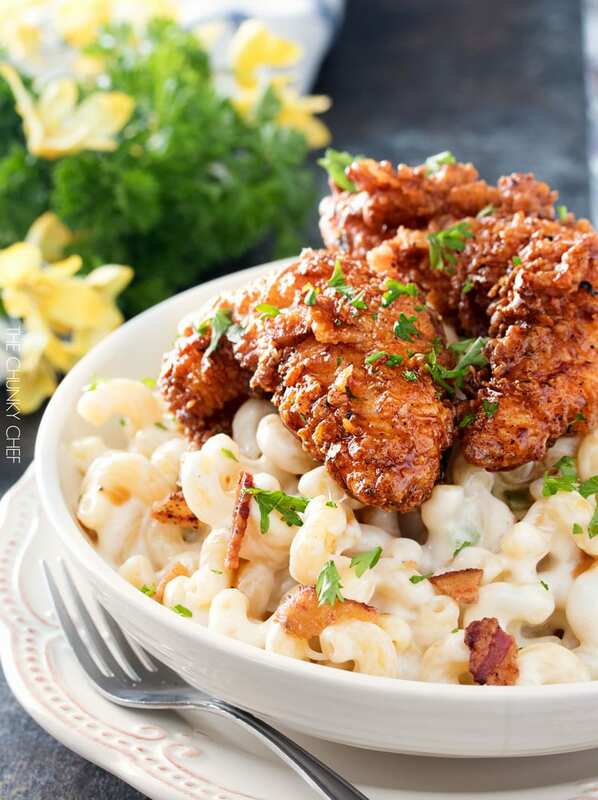 If you love Applebee's 4 cheese mac and cheese with honey pepper chicken, you absolutely have to try this homemade version that tastes even better! Cook bacon in your preferred method, and set aside to cool. Add all ingredients to a large resealable plastic bag and shake to combine. Add all ingredients to a saucepan and bring to a boil. Reduce heat to LOW and simmer for 20 minutes, or until thickened slightly. Set aside to cool a bit. 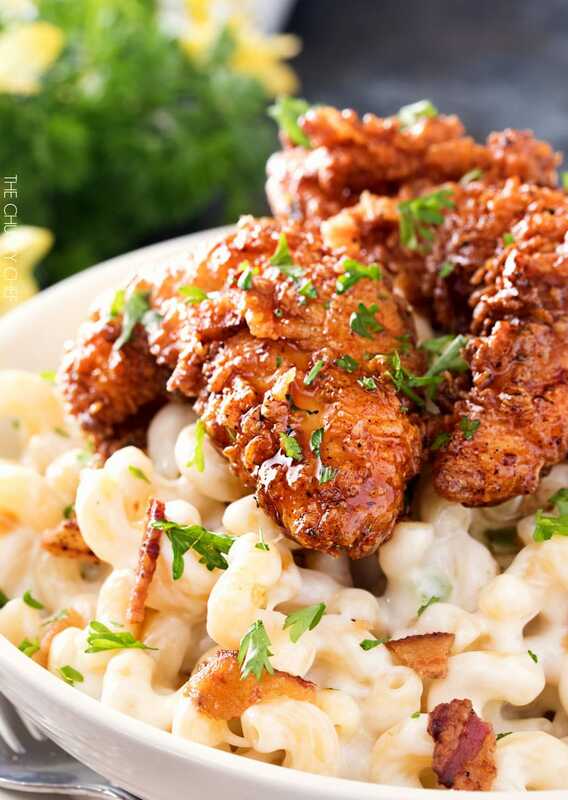 Place chicken tenders in a large bowl and pour buttermilk into bowl. Turn chicken to coat each piece in buttermilk. Let marinate while you prepare other things. Add oil to large heavy bottomed pot and heat to 350 degrees F.
Shake excess buttermilk from chicken tender, then drop into the bag with the seasoned flour. Shake gently to coat in flour. Repeat with remaining chicken tenders. Add tenders, 2-3 at a time, to the hot oil and fry for several minutes per side, until dark golden brown and cooked through. Remove from the oil and place on a wire cooling rack (with paper towels laying underneath to catch the excess grease). Repeat with remaining chicken. While chicken is frying, bring a large pot of salted water to a boil. Add pasta and cook until al dente (according to package directions). Drain pasta and drizzle with a bit of olive oil. While pasta water is coming up to a boil, add butter to a saucepan and melt over MED-LOW heat. Add garlic and diced pepper to the pan and saute for 2 minutes, until softened. Add in flour and whisk to combine. Mixture will resemble very wet sand. Pour in heavy cream while whisking, and whisk often for 5 minutes, or until thickened. 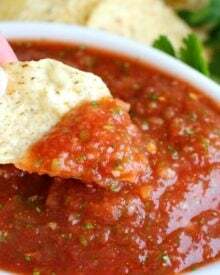 Sauce should coat the back of a spoon. Add in cheeses, one at a time, and stir to melt. Season with pepper and basil and stir to combine. Toss cooked pasta with cheese sauce and add to serving bowl. 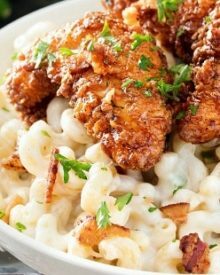 Toss fried chicken tenders with some of the honey pepper sauce, and place several chicken tenders on top of the mac and cheese. Sprinkle with crumbled bacon, minced fresh parsley, and an optional drizzle of the honey pepper sauce. The best recipe I’ve tried, and I’ve done a few. I’m obsessed with this meal and when my local Applebee’s closed unexpectedly, learning to make it was a must!! 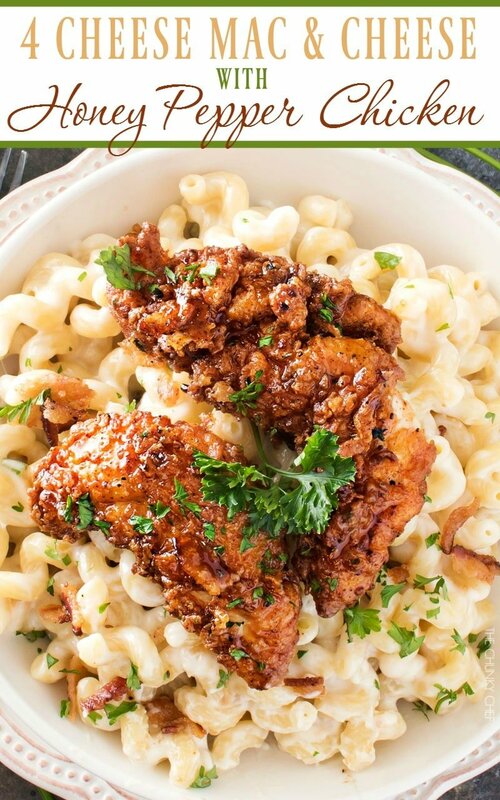 Typically I don’t like Mac and cheese as leftovers but something about adding the extra honey pepper into it makes it reheat beautifully and taste good the next day. Yes make this!! How much oil do you use to cook the chicken in and what kind of oil? Should the cheese be shredded? Yes, the cheese should be shredded, as written in the ingredients, and I usually use either vegetable or peanut oil. Just enough to fill your pot about 2 inches. This is mine and my hubby’s go to when we go to Applebees. Since I love to try new recipes I thought I’d give this a try. When you see the recipe kinda scares you a bit lol (that’s why I held off for so long lol) but like you said definitely worth it. Applebee’s who?!?!? Thank you for sharing. definitely going to add to my go to recipe. Just delicious. I’m allergic to pineapple. Do you think I could sub the pineapple juice with orange juice without changing the flavor too much? Hi Kayla 🙂 I’ve never made it with orange juice, but I think that should work just fine. This is my favourite recipe! I love how the cheese sauce thickens like no other version. However, every time I make this dish the Pepper Sauce never thickens, even a little. What am I doing wrong or should I be adding something? Hi! My hubby and I made this tonight and we LOVED it! But I had 1 question- my cheese turned out veryyyy cheesy. Like i felt like it didn’t coat the noodles like Mac and cheese should…i’m not sure where I went wrong!! Add more milk. Not heavy cream, but regular milk. That’s what I did. It thinned it out. Just add little by little to the consistency you’d like. This recipe tasted exactly like the restaurant version! It was a family effort pulling it all together but it was worth it. We forgot the Anaheim chili and the bacon but it was delicious any way. I also order this at Applebees and was so happy to find it tasted like a restaurant quality meal. It is a decadent treat. I am looking forward to trying some more of your recipes! 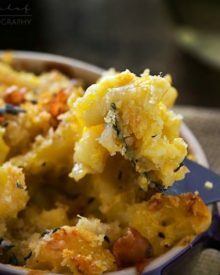 I tried the mac n cheese part of this recipe last night and it was amazing! Tasted just like the Applebee’s one! I’m so happy it made a bunch! Left overs are the best! 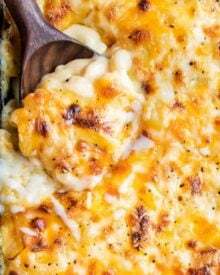 I will be making this mac n cheese recipe a lot now! I’m feeding about 6 people (including myself), and these guys can EAT~ do you recommend doubling this recipe, or does this make an adequate amount for about that many? Hi Kayleigh! No questions are annoying, I promise 🙂 The people you’re making this for, sound like my kind of people… who love to EAT!! I would say to probably double it just to be on the safe side… plus, leftovers taste pretty yummy, so if there’s any left, you’ll be able to enjoy that the next day 🙂 Frying chicken can be tricky… and I’m sorry to say I can’t give you an exact time, as it all depends on the temperature of your oil, consistency of the heat on your stove and how you cut the chicken. As long as your oil isn’t too hot (if you test it with a small piece of breaded chicken first and it turns golden brown really quickly, then it’s too hot), and it browns evenly and more slowly, then it should take between 2-4 minutes per side. The most accurate way to tell when it’s done is to test one of the bigger pieces of chicken with a meat thermometer. Chicken should be cooked to about 165 degrees F to ensure it’s fully cooked 🙂 I really hope you LOVE this dish… it’s one of our favorites!! I cannot believe how *accurate* this recipie tasted to the restaurant meal. I have no idea how you chefs do it with these copycat recipes, but omigosh it was so delish!! And they were able to back for thirds! Thank you so much for sharing this recipie; funny note, I forgot the lemon in the sauce, and didn’t even realize until we were all full, but it was so delicious! Thank you!! I will definetely look forward to trying your other recipieside ?? How much oil do you fry the chicken in? Hi Erin 🙂 It should say 1/2 stick butter… the recipe card was showing it incorrectly. I’ve fixed the glitch, thanks for bringing it to my attention! I have had the Applebees version of this recipe, which is amazing. 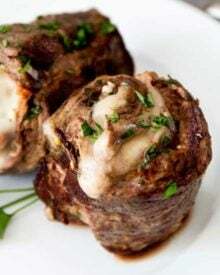 I just made this recipe tonight for dinner and it was fantastic…my husband -who is very particular- went back for seconds and commented on how good the pepper sauce was! Thanks for posting this recipe! 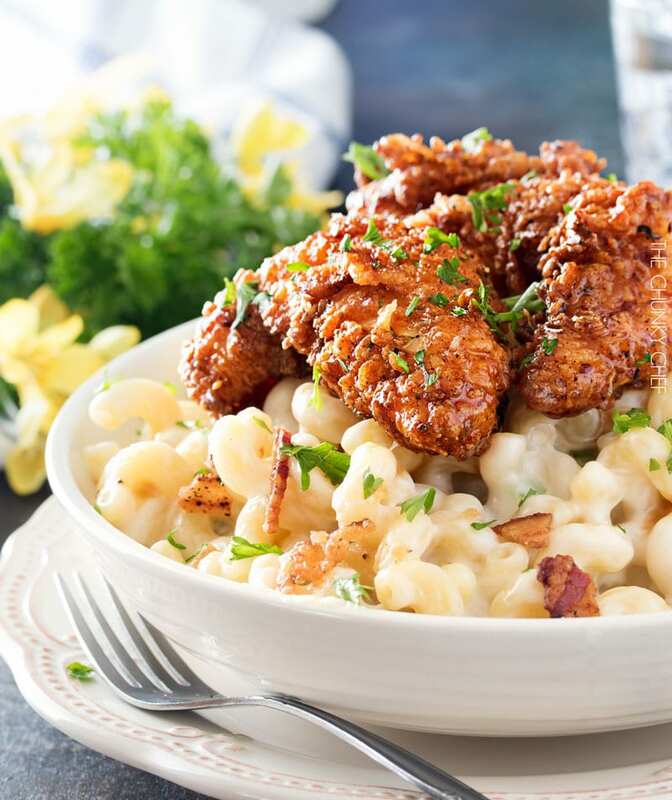 Me and my sister tried this dish at Apple Bee’s about 3 months ago And we loved it so much we ordered some more to go 🙂 , What I love about this dish it’s so full of flavor. I was told it’s one of Apple Bee’s most served dishes ! Since I have moved there is no Apples Bee’s near me at all the nearest one is like 2 hours (My heart scattered :/ ) , but I am glad I came across this recipe now I can make my own anytime I want to !!!! Hi Linda 🙂 That’s too funny that you ordered more to go… I’d probably do the same thing 🙂 I hope you love this version just as much! 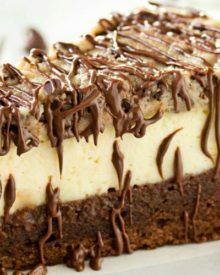 This looks absolutely decadent! My husband would love this dish! 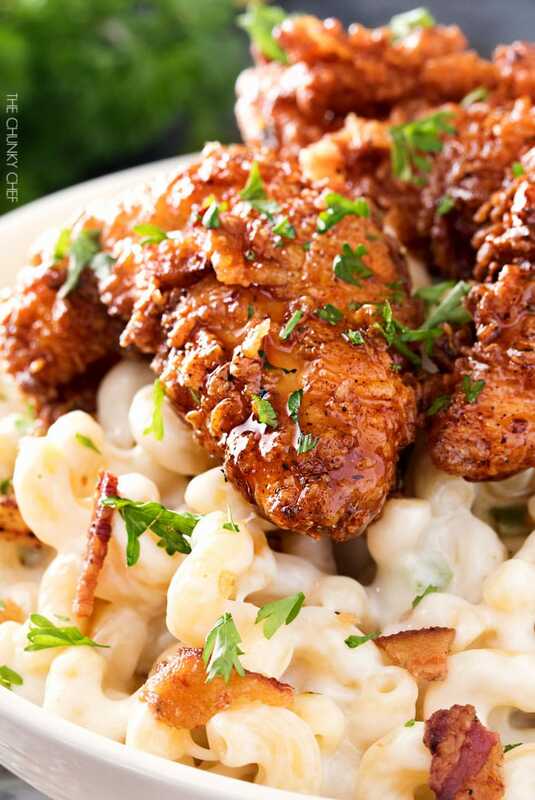 I’ve never had Applebee’s version, but now I’m certainly craving yours! WOW this looks GREAT! 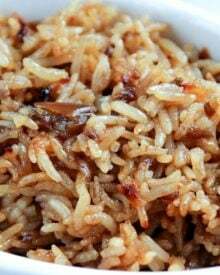 Amanda, this recipe is out of this world amazing! Five stars! How have I never tried this!?? It looks SO seriously delicious! Wow! This sounds fabulous! It will be like a flavor bomb went off in your mouth! I haven’t had this dish at Applebee’s, but am so tempted to try it at home. 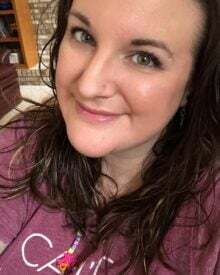 Your gorgeous photos make it look so tempting! I love the look and sound of this dish. Total comfort food, for sure. I also love the tips to make preparing it easy – perfect for our busy evenings. I’ve never had it but I so want to try now! It looks magical. And I’m just in awe of these photos. Like always when I visit your blog! Do you have a picture of your setup, by any chance? Lighting baffles me and you always have the most amazing light in your pictures! Oh wow! This recipe has so much flavor jam-crammed into each bite, and so many wonderful textures, too! And you know I’m all about easy prep and shortcuts – I just love your tips for making this recipe even easier! Totally helpful for busy weeknights!